Governor Andrew M. Cuomo today unveiled the 10th proposal of his 2018 State of the State: Bringing the New York Islanders home to Long Island with a world-class, year-round sports and entertainment destination at Belmont Park. At an event at Belmont Park Race Track, the Governor announced the selection of New York Arena Partners, a joint venture among Sterling Equities, the Scott Malkin Group, Madison Square Garden and the Oak View Group, to lead a transformational $1 billion redevelopment of Belmont Park into an internationally recognized mixed-use destination for sports, entertainment, retail and hospitality. The winning project features an 18,000-seat arena for the New York Islanders, a new 435,000-square-foot retail and entertainment complex, a new hotel, and other community amenities. The $1 billion transformational plan to redevelop Belmont Park will strengthen the local economy, boost tourism, increase visitor spending and stimulate local businesses. To accommodate New Yorkers and visitors traveling to the brand-new facility, the Long Island Railroad is committed to developing a plan to expand LIRR service to Belmont Park Station for events year-round. The state-of-the-art project is expected to create 12,300 construction jobs and 3,100 permanent jobs. "With the state-of-the-art redevelopment of Belmont Park, we are adding a crown jewel to the economic resurgence on Long Island. The return of the Islanders is exciting for all fans, bringing the storied franchise back to its rightful home," Governor Cuomo said. "The creation of this world-class entertainment destination will bring visitors from near and far, as we continue to transform the region and strengthen our economic momentum on Long Island." "We would like to thank the Governor for his vision and leadership and the staff at ESDC for all their hard work," said Jeff Wilpon on behalf of New York Arena Partners. "We look forward to developing an economic hub that Elmont and the rest of Long Island will be proud of." "Today is a historic day for Belmont, for Long Island, and for all of New York State," said ESD President, CEO, and Commissioner Howard Zemsky. "Today, this under-utilized asset becomes an engine for economic growth, thousands of jobs, vibrant tourism and major investment in Long Island - and brings an iconic team back home to its biggest fans. New York Arena Partners' development plan will bring new vitality to this region and we look forward to the work ahead." The redevelopment of Belmont Park builds on the Governor's historic $6.6 billion transformation of the Long Island Railroad. Under this transformative plan, 100 LIRR capital projects are moving forward, including the Main Line Third Track, Double Track, Jamaica Station Reconstruction, 39 renovated Long Island Rail Road stations and grade crossing eliminations strengthening the region's transportation infrastructure, and ushering in a new era of economic growth in Long Island. "With the state-of-the-art redevelopment of Belmont Park, we are adding a crown jewel to the economic resurgence on Long Island." The centerpiece of the redevelopment of Belmont Park includes an NHL-ready sports and entertainment arena that will serve as the new, permanent home of the New York Islanders. The Islanders have been a force in the NHL since their opening season in 1972 and are one of only three teams to win four or more consecutive Stanley Cups (1980-1983). The 18,000-seat arena will feature the best in operational systems like ice management, quality spectator sightlines, and generous team facilities. The mixed-use facility will be constructed with the expectation of hosting other major events, including concerts, college sports, conferences, family events and programming year-round. The new 200-250 key, full-service hotel at Belmont Park will feature sophisticated amenities, retail and dining options as well as conference and meeting spaces. With extraordinary views of the racetrack, the hotel would serve as a singular destination for guests, tourists and the local community visiting Belmont Park throughout the year. The redevelopment of Belmont Park will include 435,000 square feet of world-class retail, recreation and hospitality space. The retail village will be composed of pedestrian boulevards and squares, lined with a collection of unique stores and boutiques occupied by leading international, regional and local brands. A full slate of guest services, exhibitions, pop-up installations and special events will complement the retail space. The dining and entertainment opportunities at Belmont Park will range from sports bars to fine dining to artisanal offerings and prepared foods for take-away-and will be enhanced by leisure and athletic activities, such as a boutique movie theatre and intimate live performance venues. The project includes nearly six acres of outdoor recreation space and up to 10,000 square feet of community space to be developed in consultation with the local community. A fully developed landscape program throughout the site will serve to integrate the recreation area into the Elmont neighborhood, as well as create a green corridor and bike path buffering the residential areas adjacent to the development. Designed to blend into the landscape, a community innovation and recreation facility will be used for community events and classes and wellness activities, as well as for the storage of recreational equipment. The new Belmont Park will create a unique "Gateway to Long Island." The complex will feature new signage, public art and landscape elements designed to foster a sense of identity and arrival with access points to the Belmont LIRR platforms. The Long Island Railroad will develop a plan to modify service to accommodate New Yorkers for sporting and special events. Additional parking will be developed to accommodate the increased traffic volume, including dedicated retail, hotel and arena parking located below the concourse level, as well as areas for ridesharing, taxis and private shuttles. The pick-up and drop-off zones will be configured to maximize loading capacity and minimize queues without burdening local neighborhoods with additional traffic. High-efficiency LED lighting and heating, air conditioning systems, water conservation and waste/recycling. Empire State Development conducted a vigorous review and outreach process prior to making their decision. In July, ESD issued a competitive RFP and received three responses and they were evaluated under the highest standards and criteria. Through numerous Community Listening Sessions, two site tours, an extensive interview process with respondents, briefings with REDC and local elected officials, and over 125 received written comments - ESD ensured robust community engagement every step of the way. More information on the RFP process available here. The New York Islanders will have a 49-year lease with renewal options, valued at $40 million for the full build-out. New York State will negotiate with the New York Islanders to ensure they will play as many games as possible at the Nassau Coliseum while the state-of-the-art arena at Belmont is being built, returning the Islanders home to Long Island in the nearest possible future. New York State will continue its support of the Nassau Hub which will surround the Nassau Coliseum, and is committed to further investment in the Hub as part of the upcoming budget. Belmont Park is a major thoroughbred horseracing facility first opened in 1905 and redeveloped from 1964-1968. In July 2017, Empire State Development (ESD) issued a Request for Proposals (RFP) for the redevelopment of property within Belmont Park comprised of two parcels, totaling approximately 36 acres, both currently vacant and underutilized parking lots. Site A contains a total of approximately 8 acres, bordered on the south by Hempstead Turnpike and adjacent to the Cross Island Parkway. Site B contains a total of approximately 28 acres and is located south of the Hempstead Turnpike. Respondents were also able to propose an alternative, which includes the sites and up to 7 acres of land adjacent to Site A, north of Hempstead Turnpike. The redevelopment of Belmont Park will not impact the Belmont Park Racetrack or The Belmont Stakes. NYAP are committed to working with the surrounding community as they further develop their plans. The plan by NYAP remains subject to contractual negotiations, ESD Director review, Franchise Oversight Board review, and all public approval requirements. LIREDC Co-Chairs Hofstra University President Stuart Rabinowitz and Long Island Association President Kevin Law said, "Belmont Park has long-represented an opportunity for vibrant economic growth, and today that potential is realized with a dynamic plan from New York Arena Partners. This proposal will leverage $1 billion in investment, create more than 3,000 jobs, drive year-round regional tourism, and stimulate local businesses. The Long Island Regional Economic Council's vision for our community is grounded in smart development that makes Long Island an even better place to live, work, and play, and we are confident that this proposal will do just that. We congratulate New York Arena Partners, we thank the State for spearheading this process - and we welcome the Islanders home." Senate Majority Leader John J. Flanagan said, "With this announcement, the Islanders are returning to their rightful home here on Long Island, which is welcome news to hockey fans of every age. In addition, this project kick starts the development in and around Belmont Park, creating new jobs, new opportunities and new excitement for local taxpayers and their families. I thank all those who were involved in making this transformational project a reality, including Senator Elaine Phillips, my colleague in the state Legislature and an outspoken and tireless advocate for development at this site. Today is a great day for Long Island." 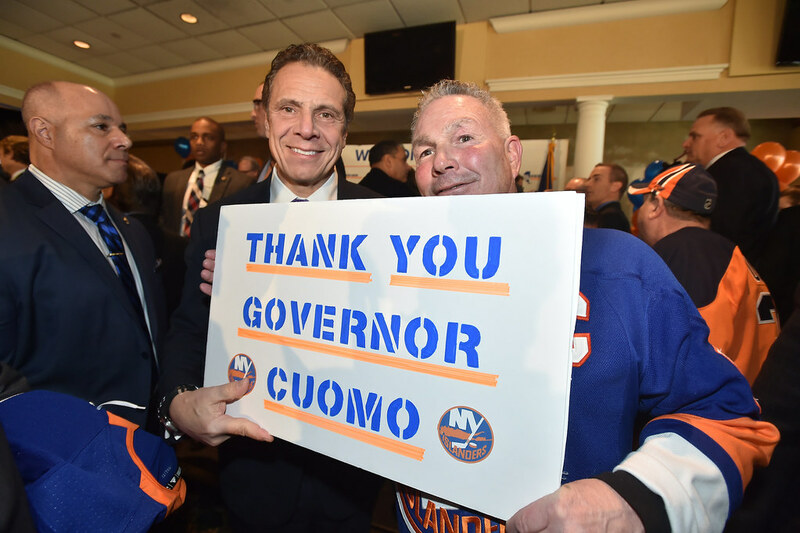 New York State Senator Elaine Phillips said, "With the New York Islanders selected as the winning bid to redevelop Belmont Park, not only is the hometown hockey team returning, but the foundation has been laid for a sweeping economic development initiative for our region. The redevelopment plan will strengthen the already existing racing industry, create much needed job growth, enhance the local business district and make Nassau County a destination location. Welcome home Islanders." New York State Senator Todd Kaminsky said, "Today's announcement by Governor Cuomo marks the beginning of game-changing development at Belmont, and a homecoming for the New York Islanders. It is critical that the State ensures that the Elmont community has a seat at the table and shares in the project's success." Senator Leroy Comrie said, "The NYAP project is the first step in ensuring that Belmont Park can finally realize its full potential as an economic engine with collaborative input from community residents." New York State Assemblymember Clyde Vanel, Esq. said, "After generations of neglect, we are excited that Belmont Park will be developed for the betterment of the local residents and the greater New York community. We will continue to work with the Governor and the Islanders to ensure that the local community is engaged with the project regarding quality of life, environmental issues, jobs and business opportunities." Nassau County Executive-elect Laura Curran said, "I am excited to finally welcome the Islanders home to Nassau County, and I'd like to thank Governor Cuomo for helping make that possible. As County Executive, I'll make sure we work with the local community and stakeholders to make sure the area is developed with their input. Economic development at Belmont will benefit all Nassau County taxpayers."